Tuesday April 1st 1902 weather some pleasanter and I am feeling better. I began to work on one of my new calico dresses. Will is putting in oats. Wednesday April 2nd 1902 I was busy with the house work all morning and sewed on my dress all afternoon. Mollie went to town to stay all night. Thursday April 3rd 1902 I had churning done in the morning and got the butter ready to go down in the afternoon. I stopped at home and Hattie rode to town with me. Will sold "Belles" colt today to Mr [Periney?] for $75.00. I did evening work and read some. Brother Rob would have been 48 years old today had he lived. Friday April 4th 1902 weather quite pleasant again. I sewed on my dress all the time I could got today. Will and Mary Woolf were here in the afternoon. Mollie went home tonight. 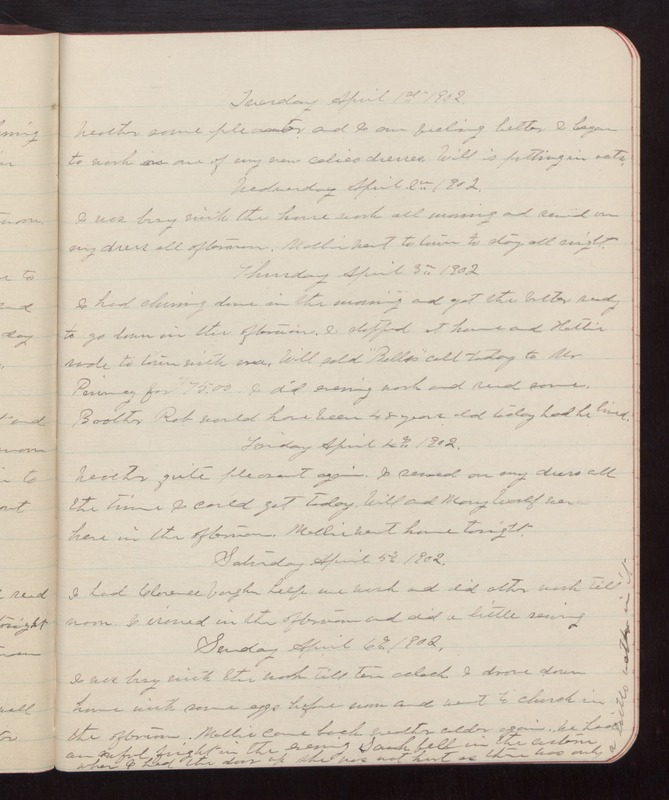 Saturday April 5th 1902 I had Clarence Vaughn help me wash and did other work till noon. I ironed in the afternoon and did a little sewing. Sunday April 6th 1902 I was busy with the work till ten o'clock. I drove down home with some eggs before noon and went to church in the afternoon. Mollie came back. weather colder again. We had an awful fright in the evening. Sarah fell in the cistern when I had the door up. She was not hurt as there was only a little water in it.